There was one bird (CR?) sheltering on the south side of the Abbey tower this morning. Alice is still at Bishop's Cleeve (info from Bob Telford). Once you get your eye in, spotting peregrines on a building gets easier. This photo was taken today at Christchurch, Cheltenham. There are two peregrines - can you spot them both? Is that you Christopher Robin? 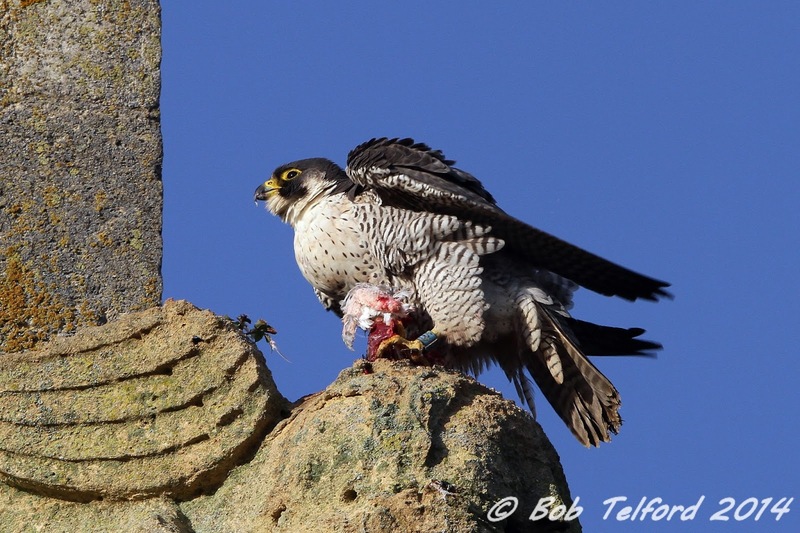 There was a peregrine at Tewkesbury this morning having its meal in the usual place on the tower. I saw it perched on the side of the tower a little later, and judging by it's size, I would say it was a male. Bob Telford also points out that Alice (aka DX) was at Bishop's Cleeve last night. Does this mean that Christopher Robin is back? The peregrines in the area are certainly keeping us guessing at the moment! There were more fresh feathers on the top of Tewkesbury Abbey tower again today, so which of the birds is eating there is a mystery. Alice has been seen regularly by Bob Telford at Bishop's Cleeve, but there have been a few evenings when she has not been seen. She was there last night, but Christopher Robin hasn't been seen for months. Fortunately there are signs of activity at Christchurch in Cheltenham where he fledged in 2010. Both the male and female are around, so things are looking good for 2015! 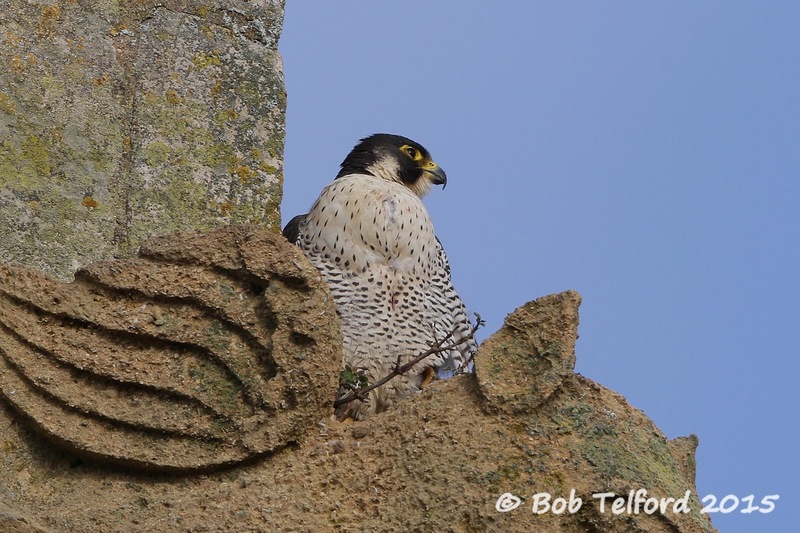 Here is a close up taken by Dave Pearce a couple of days ago of CR's dad perching on the pinnacle. 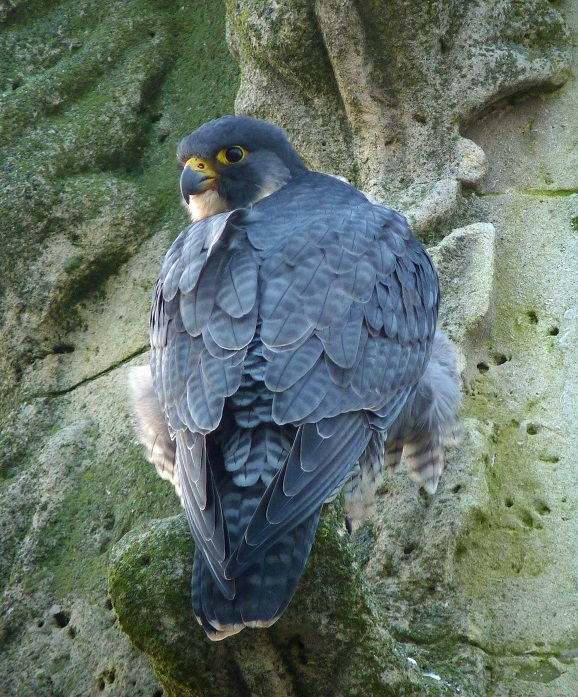 I saw a peregrine this morning on the Abbey tower, and again this evening. Both times they were on top of the water chute on the north side of the tower and difficult to see well enough to hazard a guess as to whether it was male or female. Both times, they were feeding too. Interestingly, Bob Telford also reports seeing DX at Bishop's Cleeve last night and again tonight. Does this mean that we have two birds in the area again? I went for a walk past Christchurch in Cheltenham today. Thanks to Dave Pearce, I knew where the peregrines liked to sit, and sure enough there they were! I think that these are the female (right) and male (left), and are Christopher Robin's Mum and Dad. There may well have been a third bird as well, as I am pretty sure that the female was still on the tower when the male was seeing this one off. Bob Telford kindly tells me that he has seen Alice at Bishop's Cleeve for several days in a row. So who has been leaving pigeon feathers scattered around Tewkesbury Abbey churchyard and in the gutters on the tower? Some of these look fresh to me. 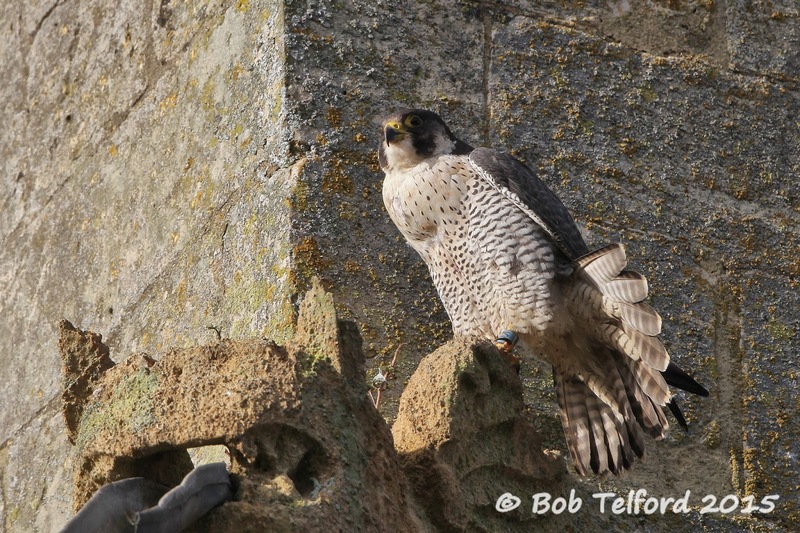 Bob Telford has spotted Alice on the tower at Bishop's Cleeve virtually every day for a couple of weeks now. Here are a couple of his photos. I went to work via Bishop's Cleeve this morning, and she was still there on the south east corner of the tower. This tower isn't all that tall, and Alice is really easy to spot from the churchyard. Bob Telford has kindly let me publish this photo he took of Alice on New Year's Eve. He spotted Alice on the Church tower at Bishop's Cleeve with her half eaten meal. She was also there again today. You can clearly see her blue ring with DX on it.